When you ask most people who is the greatest singer of all time it is an argument that will bring up a number of names. Some will be dismissed, some will have faded with the past, but one of the names that will never be disputed is Whitney Houston. Her career spanned three decades until her untimely tragic death which saw her win multiple Grammy's, Number 1 Singles and Albums and generally regarded as one of the greatest singers of all time. However, due to her death a lot of the focus has been on the tragic downfall of Houston due in many parts to her marriage to Bobby Brown. This documentary, Directed by Kevin McDonald who won the Best Documentary Oscar for One Day in September, is a wonderfully poignant look at the singer's life. Her early life and career is looked at and we get to see her amazing rise to the top of the charts which saw her have seven consecutive number ones and of course with her work on film The Bodyguard saw her win the Grammy for Album of the Year and 'I Will Always You' one of the biggest Number 1's of all time. Unfortunately, as well as looking at the highs the film looks at the lows. 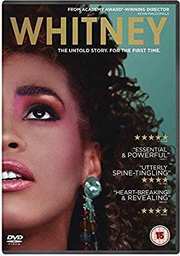 Now, I will say that if you want a full look at Whitney I would recommend watching Nick Broomfield's Whitney: Can I Be Me? documentary which was released the year before. This documentary at times felt a little too much like they did not dwell as much on the horrors of her later life and in some ways I liked and didn't like this. It felt at times like I was waiting for all the bad to happen and it did feel a bit rushed at time with this documentary. Whitney is a wonderful documentary about a wonderful singer who had such a tragic end to her life. It is sad that this is how most people remember her. Not as the radiant diva who could sing amazing songs, but as the mess that she was at the end. However, if you want a glimpse at her life this is definitely one I would recommend, especially for her fans.